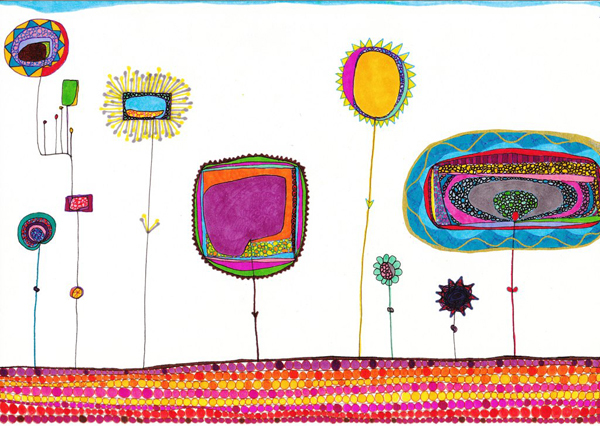 “Flowers” by Laura Didyk, Sharpie on paper, 2015. The night is deep. Hills to the west are illuminated slightly by the highway, our neighborhood still, dimly lit by streetlamps and pale moonlight. Our footfalls are distinct from each other. My father’s seem quicker. “Uh! I’m happy we’re through the hot days,” he says. We walk almost every evening. It’s the main exercise he gets, and it helps him work off some excess calories. These walks are his opportunity to commune with nature, something he’s not afforded much. He works hard. He’s overweight and over-stressed and he does very well. He fits a paradigm in that way. He talks about the movements of Earth on these walks: the seasons, where the stars are now, changing weather, the circular, fractal patterns of the observable world. At twenty three, the age I am now, he was a geology student at Yale researching corals in the Caribbean. We turn the corner of our street. There is a swirl of gnats above the guardrail of the bridge. The thin brook below croaks with frogs. Other insects harmonize, a train whistles, and we walk. Because we walked yesterday, and we will walk tomorrow and the next day there is never any reason to say how savagely awful I feel walking with him. It wouldn’t make me feel any better, and it would be excessively cruel to him. I feel terrible walking by myself or doing anything, regardless. I would like to forget that there was anything else. When I’m by myself things are empty, and I imagine that my brain consists only of tiny microscopic miners pushing carts down a shadowy track to somewhere else. No more memories. The evolutionary mechanisms of my mind can shudder along the rails, providing preference, seeking areas of comfort, and I don’t have to be present for despair, or confront the complex abyss of depression. But my father loves what he sees. He realizes the profundity of everything–fleeting life, color, love, the preciousness of galaxies and animals, himself, and me. But it is his explicit pronunciation for all this when we walk which reminds me of what’s lost, that it’s the way I see things which I can’t seem to change, that meaning and love are still part of this world but I can hardly be part of it. He loves me and I have only the most minimal capacity to reciprocate love to another human being. I can’t really bear all that, but we keep walking every day, and it’s why the discomfort of these walks is so acute, so remarkable. He says, “Listen to those bugs!” and a familiar reaction moves over me, immediate repugnance and then succeeding guilt dull in my throat. I say, “Yea,” almost too quietly. He puts his head down and strides a little faster. My father says, “Look at those flowers. They’re still blooming!” I light a cigarette. Then he asks, “What class do you have tomorrow?” “English and Spanish. I have to leave first thing”, I say. “Oh. When can we work?” he asks. “Tuesday. You want to finish the ceiling?” “Yea.” I’m turning the filter of the finished cigarette back and forth between my fingers. One of my eyes is tearing up. I think of my dog. He used to go on these walks. His bones are under flowers and a marble slab behind our house. It’s a memory I avoid. I could have done better with one of the only things that mattered. When he was dying I had nonstop nightmares. It was a sleep paralysis thing, obviously from going off all the medications and getting drunk. I was running then, maybe fifteen miles a week, and I ran more in order to sleep better but it didn’t work. Finally I just avoided sleep, stayed up late watching movies, but eventually I would doze and always had nightmares. The dog was dying on the floor and I was in my bed wanting to–whether asleep or awake. So he started sleeping next to me. He had bad dreams too and sometimes howled in his sleep, twitching. I’d shake him and he would wake startled, his eyes wet. My desperation for anything that wasn’t human, anything that wasn’t terror, ate through everything, and he was all there was, disintegrating in every instant. I would be left with my nightmares, my hatred and my grey existence, not able to figure out how to die, and he was a dimension of some love ending. Before he died the streak of bad dreams broke. The last two nights I slept fine. I had anticipated being affected significantly when he was finally gone but nothing happened. It just hurt. My father sniffs, exhales a hum of satisfaction, “Fall is my favorite! I can’t wait for it to get really cool,” I say, “Yea. Me too.” He starts to talk about something he heard on the radio. We start up a rise in the road and he takes longer steps. He says “whoo-“ as we top the incline and slow our pace. It didn’t happen all at once. There was no one event that changed everything. There were moments but nothing that’s solely responsible. There were warnings—out-of-the-ordinary short jabs, and every time I felt an eerie despair that would disrupt my life for a few days, and I always wondered the reason for that sense of loss. We’re still in stride, descending on the street that brings us back home. He puts more swing into his arms. We turn at the end of the street and onto the one we came from. No more gnats swarm on the bridge. The brook is black and trickling, and the moon is half-full above the path formed by the water, clear of trees. There is a pinkness in the dark sky, and flat clouds are moving slowly north. We pass under the magnolia tree at the beginning of our street. I can’t think of anything to say, and we both advance silently on the asphalt, blue, grey and black with different rectangular patches like a denim quilt in the moonlight. Marcus this is so beautiful and so sad. You write amazingly well. You describe yourself exactly. I sorta know how you feel. But I am a Shmoo. I get knocked down by life and then I bounce up again. I just said good-bye to my grandchildren – forever. I don’t get along with my daughter, their mother. And here I sit – writing stand-up comedy – alone on a hill in Jersey City. I am giggling to myself. I wish I could make you giggle too! BTW you will not find my stand-up on my website. Other things yes. But this is about folks I knew, who are still around.! So, it’s private.